All transactions are safe and secure with a reliable history in online purchasing behind each of our associates. 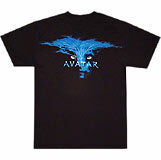 Buy the Avatar Hometree t-shirt to own Avatar clothing and merchandise. Pandora has many sacred sites but the Hometree is the center of it all. Here, many Na'vi live among its alcoves and connect with the deity who keeps Pandora in harmony, Eywa. Under the Hometree lies the valuable unobtainium deposit that leads the Na'vi and military to war. Commemorate the epic battle with this Hometree t-shirt or get in on the action with the Avatar video game available below. In addition to the Avatar Hometree tee above, browse the Avatar Clothing Gallery for more apparel like men's and women's clothes, kids shirts or hoodies.